We're going to lead with General Motors here. 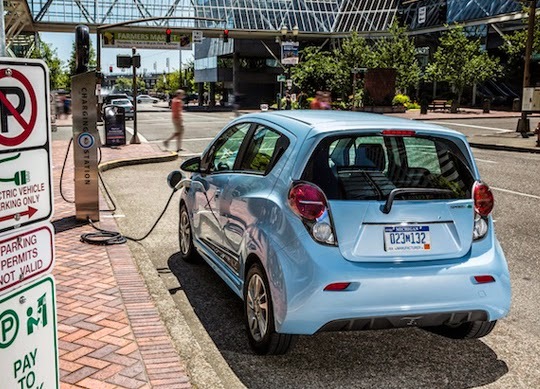 GM is one of eight automakers working with 15 utilities and the Electric Power Research Institute (EPRI) at developing a "smart" plug-in vehicle charging system. Why did we start with GM? Because it's the first automaker whose press release we read that mentioned the other seven automakers. Points for sharing. For the record, the collaboration also includes BMW, Toyota, Mercedes-Benz, Honda, Chrysler, Mitsubishi and Ford. The utilities include DTE Energy, Duke Energy, Southern California Edison and Pacific Gas & Electric. The idea is to develop a so-called "demand charging" system in which an integrated system lets the plug-ins and utilities communicate with each other so that vehicle charging is cut back at peak hours, when energy is most expensive, and ramped up when the rates drop. Such entities say there's a sense of urgency to develop such a system because the number of plug-in vehicles on US roads totals more than 225,000 today and is climbing steadily. There's a lot of technology involved, obviously, but the goal is to have an open platform that's compatible with virtually any automaker's plug-in vehicle. No timeframe was disclosed for when such a system could go live but you can find a press release from EPRI below. PALO ALTO, Calif. (July 29, 2014) – The Electric Power Research Institute, 8 automakers and 15 utilities are working to develop and demonstrate an open platform that would integrate plug-in electric vehicles (PEV) with smart grid technologies enabling utilities to support PEV charging regardless of location. The platform will allow manufacturers to offer a customer-friendly interface through which PEV drivers can more easily participate in utility PEV programs, such as rates for off-peak or nighttime charging. The portal for the system would be a utility's communications system and an electric vehicle's telematics system. As the electric grid evolves with smarter functionality, electric vehicles can serve as a distributed energy resource to support grid reliability, stability and efficiency. With more than 225,000 plug-in vehicles on U.S. roads -- and their numbers growing -- they are likely to play a significant role in electricity demand side management. The platform enables integration across multiple communication pathways, such as automated metering infrastructure (AMI), home area networks, building energy management systems, and third party entities that aggregate energy management services for commercial and industrial power customers. Researchers anticipate that grid operators in the future may call on electric vehicles to contribute to grid reliability by balancing solar and wind generation, mitigating demand charges and providing ancillary services such as frequency regulation and voltage support. Utilities and regional transmission organizations participating and supporting in the software and hardware development and demonstration include DTE Energy Company, Duke Energy, PJM Interconnection LLC, CenterPoint Energy, Inc., Southern Company, Northeast Utilities, Southern California Edison, Pacific Gas & Electric Company, San Diego Gas & Electric, Commonwealth Edison, TVA, Manitoba Hydro, Austin Energy, Con Edison and CPS Energy. Auto manufacturers are American Honda Motor Co., BMW Group, Chrysler Group LLC, Ford Motor Company, General Motors Co., Mercedes-Benz Research & Development North America, Inc., Mitsubishi Motors Corporation, and Toyota Motor Engineering & Manufacturing North America, Inc.
"A key aspect of the platform's benefits will be giving customers flexibility and choices," said Dan Bowermaster, EPRI manager of Electric Transportation. "It can help the PEV customer determine the value of using their parked vehicle as a grid resource, and help the industry develop a convenient, user-friendly customer interface. We see this as the foundation for future developments to integrate PEVs with the grid." Additionally, it could increase service reliability to customers by helping to mitigate the impact of strain on the grid during peak periods and could contribute to curbing greenhouse gas emissions. Utilities might benefit by better managing their loads and avoiding upgrades to infrastructure --savings that can be passed onto utility customers. Sumitomo Electric will develop the core platform technology on the first phase of the project. This software platform aligns with the Vehicle Grid Integration (VGI) Roadmap Initiative of the California Public Utilities Commission and the California Independent System Operator, as well as conforming with standards set by IEEE, IEC/ISO, and SAE, and Open ADR Alliance, making it globally applicable. The Electric Power Research Institute, Inc. (EPRI, www.epri.com) conducts research and development relating to the generation, delivery and use of electricity for the benefit of the public. An independent, nonprofit organization, EPRI brings together its scientists and engineers as well as experts from academia and industry to help address challenges in electricity, including reliability, efficiency, affordability, health, safety and the environment. EPRI's members represent approximately 90 percent of the electricity generated and delivered in the United States, and international participation extends to more than 30 countries. EPRI's principal offices and laboratories are located in Palo Alto, Calif.; Charlotte, NC; Knoxville, Tenn.; and Lenox, Mass. The actual service division has improved greatly since there would be a change in management around a year approximately back. If there ever is a problem the service supervisor Scott is very responsive and makes sure your experience is a great one. The majority of mercedes amg wheels for sale expect a high level of responsiveness and service and this dealership provides this.